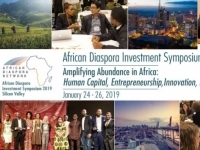 USPA NEWS - The African Diaspora Investment Symposium 2019 (ADIS2019) is the fourth annual global convening of leaders, innovators, investors, and entrepreneurs that seeks to uplift the African continent by building bridges among Africans, Diasporans, and friends of Africa. Located in Silicon Valley, the innovation and entrepreneurial capital of the world, the conference aims to inform, engage, and inspire participants to be agents of change and active contributors to Africa’s development. ADIS offers a unique opportunity to experience the dynamism and ingenuity of the Diaspora and their friends to effect positive socio-economic change on the continent. The gathering is intentionally organized to inspire, inform and foster collaborations between participants. ADIS is a two-day conference hosted by the African Diaspora Network to recognize and foster the entrepreneurial, innovative spirit of Africans in the Diaspora and their champions. The symposium is a catalyst for diaspora-driven initiatives and investment with the potential to shape the Continent’s future, as well as a platform to control the narrative about Africa. For the upcoming edition, ADIS2019, you will engage with leaders and organizations facilitating successful African investments; shift venture capital portfolios towards high-growth Africa -focused companies, and interface with entrepreneurs working on impactful innovations that are transforming their region, Africa, and the world.